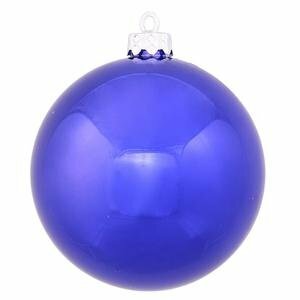 8-Inch Cobalt Blue Shiny Ball UV Resistant Shatterproof, Pre-Drilled Cap Secured with 6-Inch Green Floral Wire, 1 Year Christmas Seasonal. 1 Year Limited Manufacturer warranty. Made in China. Color: Cobalt Blue.